Gunmen killed 7 people, including at least one player, during a soccer game today in Juarez. 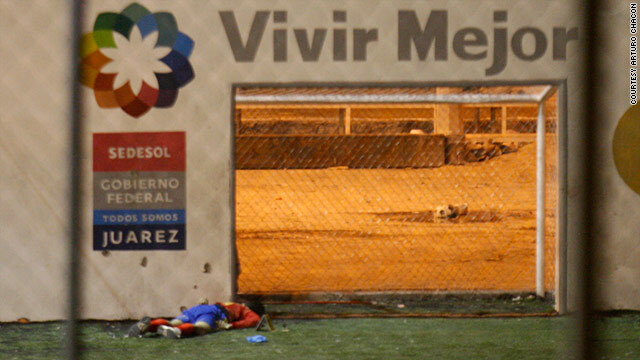 A group of heavily armed men opened fire at a soccer match between two local teams in western Ciudad Juarez, Mexico, killing seven people and wounding two others, according to a municipal police spokesman. The soccer field is at a community center opened four months ago as part of a program to decrease drug violence in a city that has been racked by violence and killings linked to drug cartels. Police said Monday they had not determined a motive for the shooting. The dead from the shooting Sunday evening were males ranging in age from 19 to 26, police said. At least one was a soccer player — an image from the scene showed the dead player face down on turf. Above him was a posted sign reading in Spanish, “Live Better” — a slogan in Juarez’s anti-violence campaign. Three victims died at the scene, while four others died on the way to area hospitals. This occurred right across the border from El Paso, Texas.